(DUBLIN) — Shimmer Sensing, a leading provider of medical grade wearable wireless sensors, announced today a partnership with the Wyss Institute for Biologically Inspired Engineering at Harvard University in support of ongoing research focused on remote patient monitoring using wearable sensing technology. The research is led by Paolo Bonato, Ph.D., who is an Associate Faculty Member at the Wyss Institute and an Associate Professor in the Department of Physical Medicine and Rehabilitation at Harvard Medical School. “Partnering with Shimmer Sensing will allow us to further develop our remote patient monitoring platform called MercuryLive,” said Bonato. MercuryLive is a platform designed to support clinicians’ remote monitoring of patients — who, for example, could have Parkinson’s disease or be stroke survivors, traumatic brain injury survivors, or children with cerebral palsy — via live streaming of wearable sensor data and an interactive video feed. Bonato’s team at the Wyss Institute is developing the latest version of the MercuryLive platform, which enables the integration of a variety of wireless devices. Shimmer’s financial support of the research and its technical expertise in wireless medical sensors will accelerate the development of MercuryLive towards applications in remote patient monitoring. 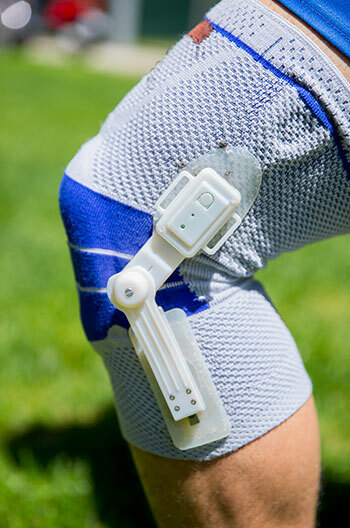 Among other clinical applications, the platform being developed will allow clinicians to remotely monitor patients with knee osteoarthritis using a knee sleeve with embedded wireless sensors and observe older adults in their home using wearable sensors and a mobile robot designed to navigate the environment and reach the subject in case of an emergency. “The Wyss Institute is renowned for taking academic innovation to the next level, and partnering with physicians and the industry to bring new technologies to the bedside. We are very enthusiastic about the opportunity to support Prof. Bonato’s research team and their work toward the development of the next generation of remote clinical monitoring systems,” commented Patrick White, the CEO of Shimmer Sensing. “Wearable patient monitoring systems represent the future of ambulatory medicine, and we are excited to help catalyze collaborations between engineers, clinicians and industrial partners to make this a reality,” said Wyss Institute Founding Director Donald Ingber, M.D., Ph.D., who is also the Judah Folkman Professor of Vascular Biology at Boston Children’s Hospital and Harvard Medical School and Professor of Bioengineering at the Harvard John A. Paulson School of Engineering and Applied Science.